John Wesley (…) was an English cleric and theologian who, with his brother Charles and fellow cleric George Whitefield, founded Methodism. Educated at Charterhouse School and Christ Church, Oxford, Wesley was elected a fellow of Lincoln College, Oxford in 1726 and ordained as an Anglican priest two years later. He led the “Holy Club”, a society formed for the purpose of study and the pursuit of a devout Christian life; it had been founded by his brother Charles, and counted George Whitefield among its members. After an unsuccessful ministry of two years at Savannah in the Georgia Colony, Wesley returned to London and joined a religious society led by Moravian Christians. On 24 May 1738 he experienced what has come to be called his evangelical conversion, when he felt his “heart strangely warmed”. He subsequently left the Moravians, beginning his own ministry. A key step in the development of Wesley’s ministry was, like Whitefield, to travel and preach outdoors. In contrast to Whitefield’s Calvinism, Wesley embraced the Arminian doctrines that dominated the Church of England at the time. Moving across Great Britain and Ireland, he helped form and organise small Christian groups that developed intensive and personal accountability, discipleship and religious instruction. Most importantly, he appointed itinerant, unordained evangelists to travel and preach as he did and to care for these groups of people. Under Wesley’s direction, Methodists became leaders in many social issues of the day, including prison reform and the abolition of slavery. Although he was not a systematic theologian, Wesley argued for the notion of Christian perfection and against Calvinism—and, in particular, against its doctrine of predestination. He held that, in this life, Christians could achieve a state where the love of God “reigned supreme in their hearts”, giving them outward holiness. His evangelicalism, firmly grounded in sacramental theology, maintained that means of grace were the manner by which God sanctifies and transforms the believer, encouraging people to experience Jesus Christ personally. Throughout his life, Wesley remained within the established Church of England, insisting that the Methodist movement lay well within its tradition. In his early ministry, Wesley was barred from preaching in many parish churches and the Methodists were persecuted; he later became widely respected and, by the end of his life, had been described as “the best loved man in England”. In 2002, he was placed at number 50 in the BBC’s poll of the 100 Greatest Britons. Burnett calls this event Wesley’s “Evangelical Conversion”. It is commemorated in Methodist churches as Aldersgate Day. Wesley allied himself with the Moravian society in Fetter Lane. In 1738 he went to Herrnhut, the Moravian headquarters in Germany, to study. On his return to England, Wesley drew up rules for the “bands” into which the Fetter Lane Society was divided and published a collection of hymns for them. He met frequently with this and other religious societies in London but did not preach often in 1738, because most of the parish churches were closed to him. Wesley was unhappy about the idea of field preaching as he believed Anglican liturgy had much to offer in its practice. Earlier in his life he would have thought that such a method of saving souls was “almost a sin.” He recognised the open-air services were successful in reaching men and women who would not enter most churches. From then on he took the opportunities to preach wherever an assembly could be brought together, more than once using his father’s tombstone at Epworth as a pulpit. Wesley continued for fifty years—entering churches when he was invited, and taking his stand in the fields, in halls, cottages, and chapels, when the churches would not receive him. Late in 1739 Wesley broke with the Moravians in London. Wesley had helped them organise the Fetter Lane Society, and those converted by his preaching and that of his brother and Whitefield had become members of their bands. But he believed they fell into heresy by supporting quietism, so he decided to form his own followers into a separate society. “Thus,” he wrote, “without any previous plan, began the Methodist Society in England.” He soon formed similar societies in Bristol and Kingswood, and Wesley and his friends made converts wherever they went. As his societies needed houses to worship in, Wesley began to provide chapels, first in Bristol at the New Room, then in London (first The Foundery and then Wesley’s Chapel) and elsewhere. (…) in 1743 he drew up a set of “General Rules” for the “United Societies”. These were the nucleus of the Methodist Discipline, still the basis. Wesley laid the foundations of what now constitutes the organisation of the Methodist Church. As the number of preachers and preaching-places increased, doctrinal and administrative matters needed to be discussed; so John and Charles Wesley, along with four other clergy and four lay preachers, met for consultation in London in 1744. This was the first Methodist conference; subsequently, the conference (with Wesley as its president) became the ruling body of the Methodist movement. As the societies multiplied, they adopted the elements of an ecclesiastical system. The divide between Wesley and the Church of England widened. The question of division from the Church of England was urged by some of his preachers and societies, but most strenuously opposed by his brother Charles. Wesley refused to leave the Church of England, believing that Anglicanism was “with all her blemishes, […] nearer the Scriptural plans than any other in Europe”. In 1784, he believed he could not longer wait for the Bishop of London to ordain someone for the American Methodists, who were without the sacraments after the American War of Independence. The Church of England had been disestablished in the United States, where it had been the state church in most of the southern colonies. The Church of England had not yet appointed a United States bishop to what would become the Protestant Episcopal Church in America. Although Wesley rejoiced that the Methodists in America were free, he advised his English followers to remain in the established church and he himself died within it. The 20th-century Wesley scholar Albert Outler argued in his introduction to the 1964 collection John Wesley that Wesley developed his theology by using a method that Outler termed the Wesleyan Quadrilateral. In this method, Wesley believed that the living core of Christianity was revealed in Scripture; and the Bible was the sole foundational source of theological development. The centrality of Scripture was so important for Wesley that he called himself “a man of one book”—meaning the Bible—although he was well-read for his day. However, he believed that doctrine had to be in keeping with Christian orthodox tradition. So, tradition was considered the second aspect of the Quadrilateral. The doctrines which Wesley emphasised in his sermons and writings are Prevenient Grace, present personal salvation by faith, the witness of the Spirit, and sanctification. Prevenient grace was the theological underpinning of his belief that all persons were capable of being saved by faith in Christ. Unlike the Calvinists of his day, Wesley did not believe in predestination, that is, that some persons had been elected by God for salvation and others for damnation. He understood that Christian orthodoxy insisted that salvation was only possible by the sovereign grace of God. He expressed his understanding of humanity’s relationship to God as utter dependence upon God’s grace. God was at work to enable all people to be capable of coming to faith by empowering humans to have actual existential freedom of response to God. Wesley defined the witness of the Spirit as: “an inward impression on the soul of believers, whereby the Spirit of God directly testifies to their spirit that they are the children of God.” He based this doctrine upon certain Biblical passages (see Romans 8:15–16 as an example). This doctrine was closely related to his belief that salvation had to be “personal.” In his view, a person must ultimately believe the Good News for himself or herself; no one could be in relation to God for another. Sanctification he described in 1790 as the “grand depositum which God has lodged with the people called ‘Methodists’.” Wesley taught that sanctification was obtainable after justification by faith, between justification and death. He did not contend for “sinless perfection”; rather, he contended that a Christian could be made “perfect in love”. (Wesley studied Eastern Orthodoxy and particularly the doctrine of Theosis). This love would mean, first of all, that a believer’s motives, rather than being self-centred, would be guided by the deep desire to please God. One would be able to keep from committing what Wesley called, “sin rightly so-called.” By this he meant a conscious or intentional breach of God’s will or laws. A person could still be able to sin, but intentional or wilful sin could be avoided.
. Wesley taught that conversion to Jesus is proved by practice (testimony), not by the emotions of the moment.
. Appreciation of the lay preachers who participated side by side with the clergy of the Mission of evangelization, assistance and training of other people.
. He affirms that the center of the Christian life is in the personal relationship with Jesus Christ. It is Jesus who saves us, forgives us, transforms us and offers us the abundant life of communion with God.
. It values and recovers in its practice the emphasis on the action and doctrine of the Holy Spirit as vital power for the Church.
. It recognizes the need to live the Gospel communally. John Wesley asserted that “to make the Gospel a religion alone is to destroy it”.
. He cares about the total human being. It is not only with spiritual well-being but also with physical, emotional, material well-being. That is why we must take care of our neighbor in its entirety, especially the needy and social marginalized.
. We can say that spiritual well-being is the result of the peace of Christ that reaches all areas of the Christian’s life. It is the result of physical, emotional, economic, family, community well-being. Everything is in God’s hands, we trust in Him and He is faithful in taking care of us. His salvation reaches us wholly.
. Emphasizes the passion for evangelization. We desire and should work with passion, perseverance and joy so that God’s love and mercy reach men and women everywhere and at all times.
. It accepts the fundamental doctrines of the Christian faith, as stated in the Apostles’ Creed (We believe in the Bible, in God, in Jesus Christ, in the Holy Spirit, in the human being, in the forgiveness of sins, in the victory through disciplined life, in the centralization of love , in Christian safety and perfection, in the Church, in the Kingdom of God, in eternal life, in the second coming of Jesus, in the grace of God for all, in the possibility of the fall of divine grace, in intercessory prayer, in world missions. (the love of God), emphasizing the balance between acts of piety (acts of devotion) and acts of mercy (the practice of love for others). Later in his ministry, Wesley was a keen abolitionist, speaking out and writing against the slave trade. He published a pamphlet on slavery, titled Thoughts Upon Slavery, in 1774. To quote from one of his tracts against the slave trade: “Liberty is the right of every human creature, as soon as he breathes the vital air; and no human law can deprive him of that right which he derives from the law of nature”. Wesley influenced George Whitefield to journey to the colonies, spurring the transatlantic debate on slavery. Wesley was a friend of John Newton and William Wilberforce, who were also influential in the abolition of slavery in Britain. Wesley travelled widely, generally on horseback, preaching two or three times each day. Stephen Tomkins writes that he “rode 250,000 miles, gave away 30,000 pounds, … and preached more than 40,000 sermons… ” He formed societies, opened chapels, examined and commissioned preachers, administered aid charities, prescribed for the sick, helped to pioneer the use of electric shock for the treatment of illness, superintended schools and orphanages and published his sermons. Wesley practised a vegetarian diet and in later life abstained from wine for health reasons. Wesley warned against the dangers of alcohol abuse in his famous sermon, The Use of Money, and in his letter to an alcoholic. 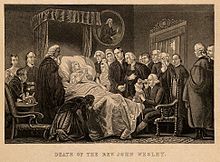 Wesley on his deathbed: “The best of all is, God is with us”. Mezzotint by John Sartain. Wesley died on 2 March 1791, at the age of 87. As he lay dying, his friends gathered around him, Wesley grasped their hands and said repeatedly, “Farewell, farewell.” At the end, he said, “The best of all is, God is with us”, lifted his arms and raised his feeble voice again, repeating the words, “The best of all is, God is with us.” He was entombed at his chapel on City Road, London. Because of his charitable nature he died poor, leaving as the result of his life’s work 135,000 members and 541 itinerant preachers under the name “Methodist”. It has been said that “when John Wesley was carried to his grave, he left behind him a good library of books, a well-worn clergyman’s gown” and the Methodist Church. Wesley continues to be the primary theological influence on Methodists and Methodist-heritage groups the world over; the largest bodies being the United Methodist Church, the Methodist Church of Great Britain and the African Methodist Episcopal Church. Wesleyan teachings also serve as a basis for the holiness movement, which includes denominations like the Wesleyan Church, the Free Methodist Church, the Church of the Nazarene, the Christian and Missionary Alliance, the Church of God (Anderson, IN), and several smaller groups, and from which Pentecostalism and parts of the Charismatic Movement are offshoots. Wesley’s call to personal and social holiness continues to challenge Christians who attempt to discern what it means to participate in the Kingdom of God. In addition, he refined Arminianism with a strong evangelical emphasis on the Reformed doctrine of justification by faith. In 2002, Wesley was listed at number 50 on the BBC’s list of the 100 Greatest Britons, drawn from a poll of the British public.